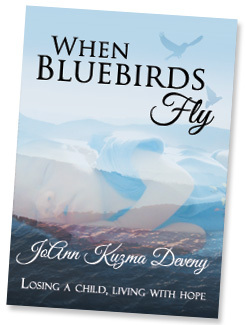 “When Bluebirds Fly starts with a riveting account of the Deveny’s journey to their son’s bedside, and then leads you through the adversities that often come with a tragedy: alcoholism, gambling addictions, panic attacks, bankruptcy and more along with the loss and rediscovery of faith. But the story doesn’t end there. After life’s momentum brings them through marital difficulties and back, it concludes their relationship with a surprising turn of events. JoAnn will also be the featured speaker on November 23rd at Widow Might’s 3rd Annual NOVEMBERING DINNER. Register here. 3 Responses to "When Bluebirds Fly…Losing a Child, Living with Hope"
I can’t find where you register to win a copy of the book. I find it amazing that people open up and share their journey and their faith stories. I wish her all the best. Hi Julie! Looks like you’re the winner of the book! Can u please send me an email at pam@myktis.com with your mailing address? Thanks for listening and have a blessed day! I heard Joanne’s story on KTIS this morning.This story hit home as my step brother was called home on October 20th. The news of his death was very unexpected. There are a lot of similarities with what her husband had gone through and that he had had a doctor appointment scheduled as did my step brother. Is there a website to purchase the book?